Brand: Pagoda International Footwear Ltd. The shoe has four decorative wheels that can detach, posing a choking hazard to young children. This recall involves about 73,000 Buster Brown & Co. "CARS" fleece clog children's shoes. 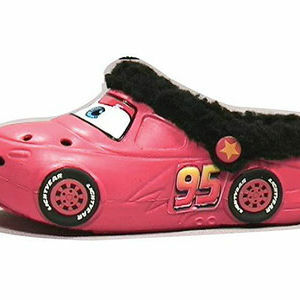 Each shoe is a red plastic molded clog with fleece lining and is designed to resemble a car. The shoes were sold in infant sizes 4 to 6 and toddler sizes 7 to 11. The infant-size shoes have a strap in the back. Each side of the shoe has two red and black decorative wheels and the number "95." "Buster Brown & Co." and "Disney" are printed on a tag sewn inside the shoe. Wal-Mart stores in the United States and Canada from September 2008 through March 2009 for between $6 and $10 (U.S.) and for about $13 (CAN). Take this product away from children immediately and return it to the nearest Wal-Mart store for a full refund. For more information, contact Buster Brown & Co. toll-free at (888) 869-1044 between 7 a.m. and 7 p.m. CT Monday through Friday and between 10 a.m. and 6:30 p.m. CT on Saturday, visit www.busterbrownshoes.com, or send an e-mail to Busterandtige@brownshoe.com.